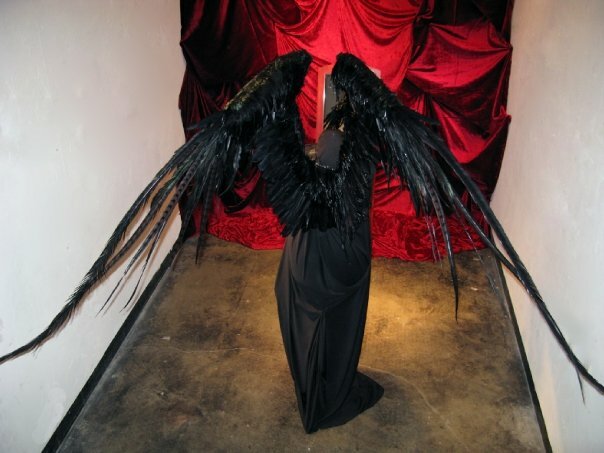 This wing set is attached permanently to its harness, which is painted black and disguised by black feathers. It is fully articulate, and operates by cable to open and close. The position seen in this image is closed. The wingspan is approximately 10 feet. The price is particularly high for this one due to the extra-long feathers, and other specialty feathers used, as well as the movement mechanism. Basic models use three types of feathers, and this one used six! Feathers included are naturally shed duck, goose and pheasant feathers.